A favorite question for my two year old daughter to ask is, “Is that funny?” She’ll make a face (yes), do a dance (yes), or spit (no), and follow up with a quick check-in—”Is that funny?” So much of being a kid is about asking that question. And so much of being a parent is figuring out that answer. You have to think fast about these things (in case you haven’t heard, kids aren’t big fans of waiting). The longer it takes you to say no, the less wrong they think it is and the harder it is to undo. And the hardest part is, sometimes you have to act contrary to your instinct. You have to be serious, even when you want to laugh. You have to tell them not to wrestle, even though it looks fun. You have to think of the future. Wally has been getting into drawing lately. He brings these little pieces of white paper home from school with creations. I was talking to a few of the moms of girls from his class, who both separately reported that Wally sends these papers home with their girls. The moms called them early love notes. Wally denies the whole thing. Wally’s most recent drawings have been asking me “Is that funny?” Just today, he gave me this one. 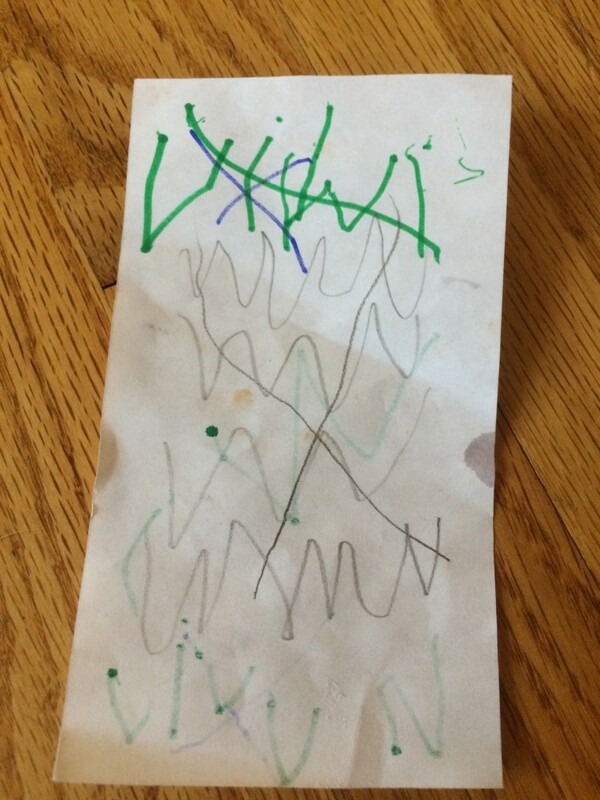 No picture, just his first word to write on his own besides his own name. He said, “Look mom! It says, ‘No Vivvi allowed’!” I was so…proud? And last week he drew himself with his two teachers, which I thought was very sweet. He told me which teacher was which, and I asked why. He said, “Because this one has flat hair, and this one has big fat hair.” The picture is now hidden and will not be delivered to his teachers in case he decides to give them that explanation. Last week I was having a day. By that, I mean that I was flying high in the morning, pumped up on caffeine and feeling like I could conquer the world. I was grateful for my kids, who were saying cute things in the back seat on the way to preschool drop off. And by 5 PM, I was checking the clock, counting the minutes until Husband Wally pulled in the driveway and gave me some relief from the two who were playing a strange game they invented that involves laying on each other’s heads until one of them nearly suffocates. I had just finished explaining to WV that breath is required for living when he left the room and returned with a drawing. This drawing. Whatever you do, don’t laugh. 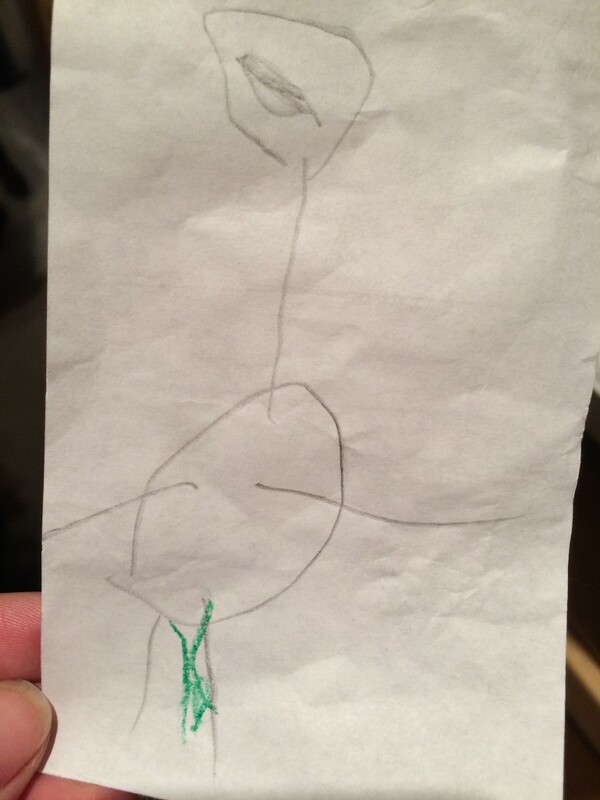 Okay, he drew the pencil part of picture this morning at preschool. I saw it in his hands when I picked him up. The poop is a late addition, clearly. If I didn’t know that, the newly introduced green crayon color gives that away. So the kid decides poop is a good addition to the picture? How about another eyeball? A nose? A mouth? How about some ears, hair, fingers? You really looked at this picture you drew and thought, “I know what it’s missing! Poop!” And also, green? Have you been eating too many green peppers? What he really wants to know by showing me this picture is, “Is that funny?” I’ve been training to answer the question in his eyes my whole parenting career. No laughing. He has been doing way too much potty talk lately. If he does this at school, he will probably get in trouble. Other kids will tell their parents, and they will think of him as the kid who draws poop. Is that funny? No. Do. Not. Laugh. “It’s not funny, Wal. Take a time out.” A short one, I think. I can’t wait to tell Ethan that his dad and I secretly cracked up at the fact that he got suspended over a fight for the Glockenspiel in music class. But for now, not funny. Hey Mollie, thank you for your thoughts. But, you need to let little boys wrestle. God made little boys that way. They need to play rough and sit on their sister’s heads too. If you don’t allow this, weird behavior pops out like playing with dolls or making pictures for little girls. As far as poop drawings, I sincerely believe that bathroom graffiti has gone down the crapper. Tell me the last graffiti you saw that actually made you laugh or almost made you puke. I believe you should encourage W5 with his poop art.